Alright everyone. This is the big one. I've had the bits and pieces of this one working for two and half years and I finally feel ready enough to get this one out to the public. This project began when I wondered one day what would happen if Nike did something ludicrous and somehow managed to get apparel rights to every single FBS level team. Of course this is seemingly impossible in the real world, but it was fun to think about. Then I took it one step further. 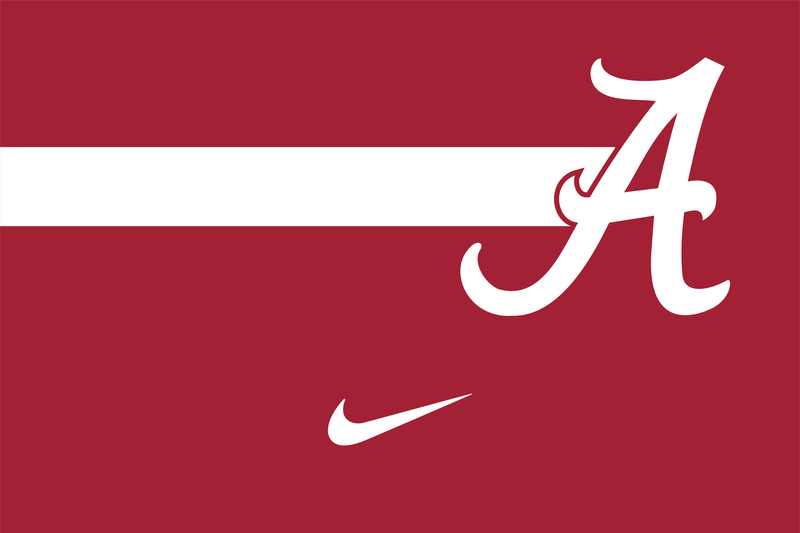 Not only would get every FBS football team, but if every FBS football team also had a Division 1 basketball, baseball and hockey team for Nike to get their hands on. So the goal here is one, to actually finish this idea, but more than that, is to see if I can create a unique identity for 130 some teams across 4 different sports. This means that some traditional looks will be changed slightly and some might change drastically. Nevertheless, I'm excited to get this off the ground and share it with you guys. (I also will create one of these cool team headers for every team). Ohio's sports have a rather laid back and simplistic look to them. Even with adidas/Russell at the helm of their apparel, they don't have too crazy of a look and I kept that in mind as I designed their uniforms for this. Keeping that in mind, I left their football uniforms pretty much the same as they have been the last couple years. Biggest change here is the addition of real pants stripes as opposed to no stripes or very short stripes. I limited black to an alternate set that would hopefully be worn separately, but in the current state of college football we all know that wouldn't happen. The hockey uniforms are very similar to how the football uniforms go. I did consider shoulder logos for them but I didn't keep them, as it just didn't feel right to me. Baseball uniforms again are very simple and consistent with the rest of the uniforms. Biggest thing here and across the board is that there is no longer a "grey away" designation. Unless a team has grey in their set, I won't be giving a team a grey uniform for baseball. Basketball is consistent with the rest. I didn't want to go full Celtics with Ohio, so the double stripe pattern is on the shoulders and the collar trim is a solid color. On the shorts the waistband is striped and the hem is a solid color. C&C is welcome as always. Given the larger nature of this thread, I'll try and get the next team up as soon as I can. Damn, that’s a big project. Hopefully you can get it done. All your work is always amazing, expecting this to follow suit. Big project ahead of you! Off to a great start, man. Looking forward to tracking this series! I swear to God, if you complete this in full, my member title will read "BKKnight is a beast", "BKKnight beat Chuck Norris thumb wrestling with both hands tied behind his back" or whatever you want it to say for a month. Honestly, I think you'll do it, and if you do I wanna give you the mad props you'd deserve. Prove me right. Normally, the notion of Nike gaining complete control of college uniforms would be a terrifying thought, but man, I will have your babies if you get even halfway through. Yes, I know that isn't biologically possible. I don't care. Much like the Ohio Bobcats, Clemson doesn't take things too wild with their uniforms. Their uniforms across the four sports have a classic feeling to them. Well, except for maybe the newest basketball uniforms with the tiger pattern going up the sides. For the Tigers, I took what I found to be the most identifiable icon of their sports and used that as the base for their identity and to me that was their football helmet. Another goal of this was to get purple more involved. While I don't think that it should be used overwhelmingly, it adds a nice contrast to the orange and white. Football - Did you expect a large change? The helmet didn't change at all and I didn't add any alternate helmets. Any other color looks weird for the football team. For the jerseys, I love the paw logos on the shoulders and I added the stripes on the sleeves to get more purple in the jerseys. I changed the pants stripe to match the helmet and jersey striping. 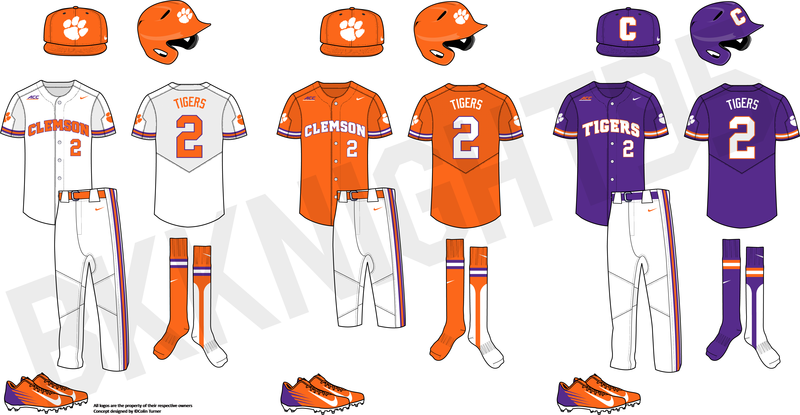 Orange and white remain the home/away with purple being the alternate. Hockey - Much like the football uniforms, the uniforms are very simple. Paw print on the chest, with stripes on the sleeves and the hem. For the alternate, I took a page from their club hockey team and did a uniform with a chest stripe and the paw print on that. I went a little out of the box with the pants and helmets. I didn't like how a white helmet looked so both the home and away uniforms would be worn with an orange helmet and the alt gets a purple helmet. As for the pants, I thought purple provided the best contrast, but I also added an orange pair if they felt like being a little different. 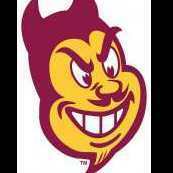 Baseball - Alright first off, I just want to say that while most college baseball teams have a script logo that's baseball only, a lot of those might end up going by the wayside and at the same time they might get used on other uniforms as well. Just a warning as we move forward. Anyways, Clemson was one team that loses their scripty font. I just felt like it didn't match the aesthetic I was setting up. Main hat/helmet is orange with the paw print and the alternate hat/helmet is purple with the block C on the front. Uniforms don't deviate too much from what exists already. 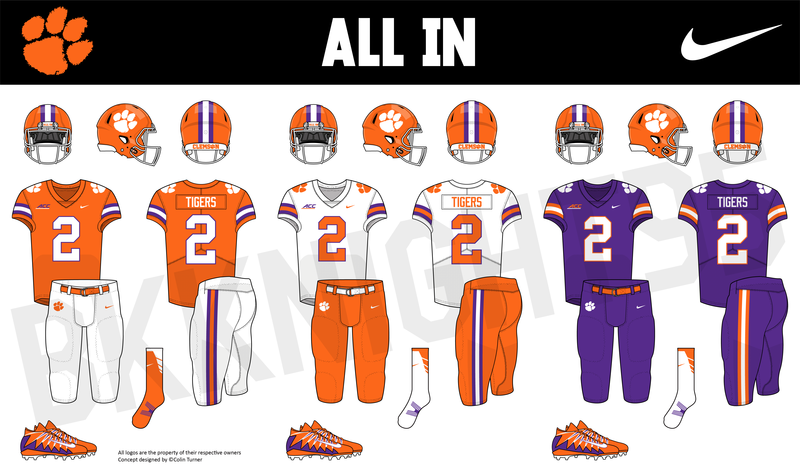 Biggest difference is the block CLEMSON on the front of the home and away and TIGERS on the alternates. Pants have the same striping and the socks are striped as well. Basketball - Basketball changes a fair bit. Simple one color striping on the sleeve and collars with the triple stripe down the side of the jersey. Shorts have colored waistbands with the stripes down the sides and around the bottom hems of the shorts. Paw logo on the sides as well. The alternates clean up a little bit and get rid of some of the single color striping and the waistband. 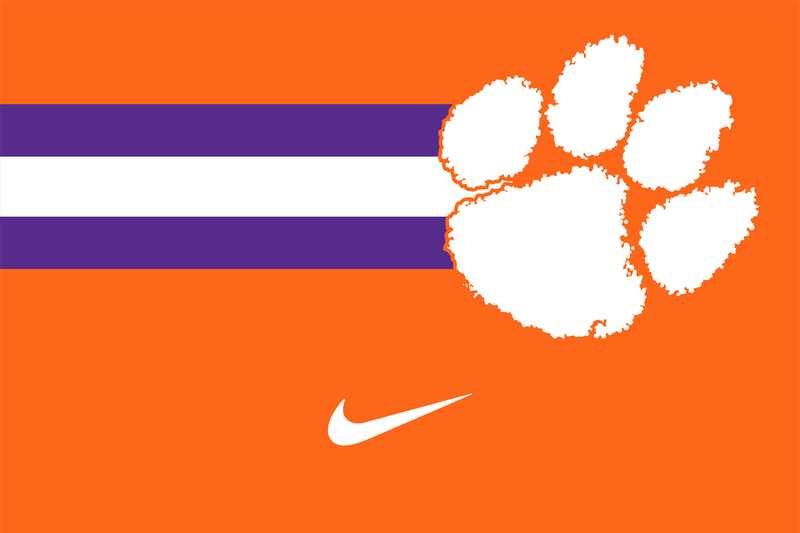 I changed the wordmark to the CLEMSON with the paw replacing the O. Why did you name the series "Project 1972?" Football - Like I said above the football uniforms have simple for ages. Even with the recent catalog nonsense, they haven't been too wild all things considering. That said the helmet didn't change much. 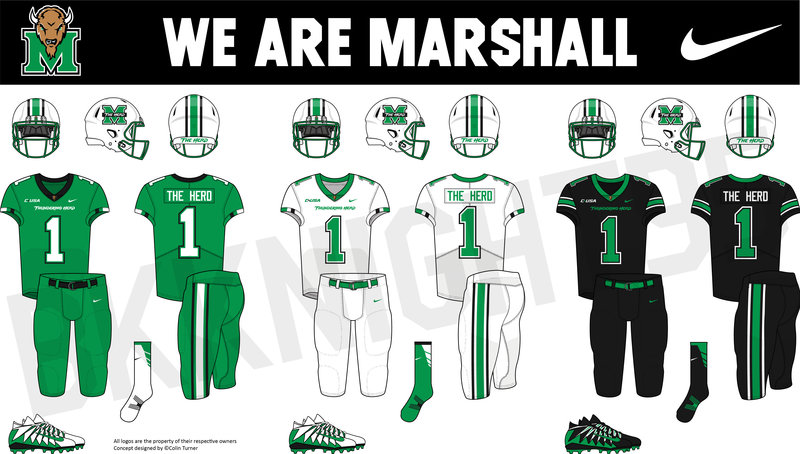 The facemask became green and I used the M with the black strip with THE HERD in it. Jerseys are relatively simple, I tried something different and put the stripes vertically in the cuff. Trying something new here in the name of uniqueness. Shoulder numbers have been a mainstay of the Herd uniforms so they stayed. For the black alternates I used more traditional striping. I knocked around the idea of a black helmet but it didn't look all that great to me, plus Marshall in any other color helmet just looks wrong. Hockey - So I couldn't keep the whole short stripe motif working on a hockey jersey so the stripes are a tad bit more normal. On the home and away jerseys, I used the M logo with the Buffalo. I kept the shoulder numbers on the hockey jerseys. I don't understand why its so taboo in hockey to have TV numbers on the shoulders. 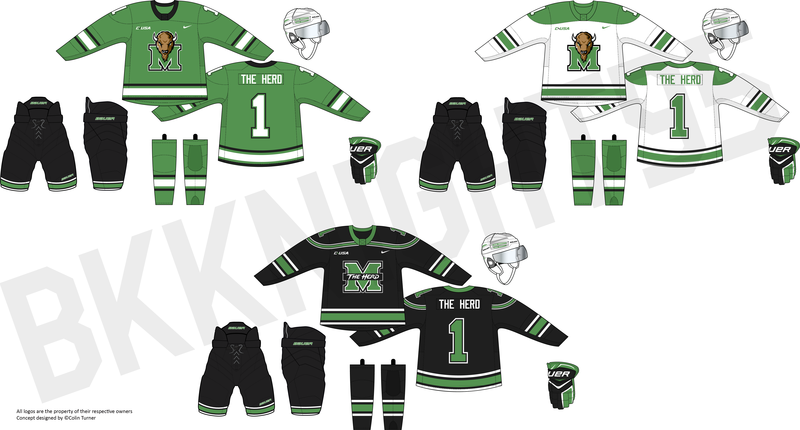 On the black jerseys I added the NW striping around the yoke and used "THE HERD" M logo. Baseball - Remember my speech about getting rid of scripty fonts from the Clemson post? Yeah this isn't the case of getting rid of it. I really like the scripty font they use for baseball and basketball so I kept it and edited it a bit. So for the home and away, much like football, I did the short vertical stripe. Pants have the normal stripe as do the socks. 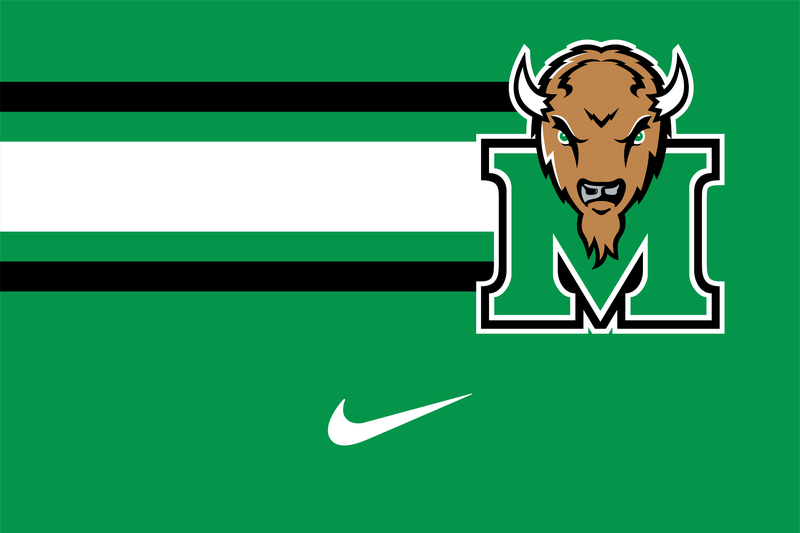 Alternate, again is like the football alternate with a scripty "THE HERD" font. Basketball - So if you haven't guessed by now, the theme here is simplicity and short stripes. So for basketball the home and away have truncated stripes not unlike a uniform they wore a few years back. Colored waistbands and the M logo on the shorts leg. The alternate uniform carries on the theme with more traditional striping. I named it that because I was doing some research about Nike in my History 100 class a few years back and I read an article about the first time Nike was in the limelight and it was in 1972 at a track race and Steve Prefontaine was one of the first athletes to wear Nike gear in a large scale setting and how this was the moment when Nike was really "born". So that's how the name got its name. Plus my original name of "Nike Gets It's Greedy Hands On Everything" didn't really flow that well. This is one heck of an undertaking. I'm excited to see how this turns out. Great work so far! 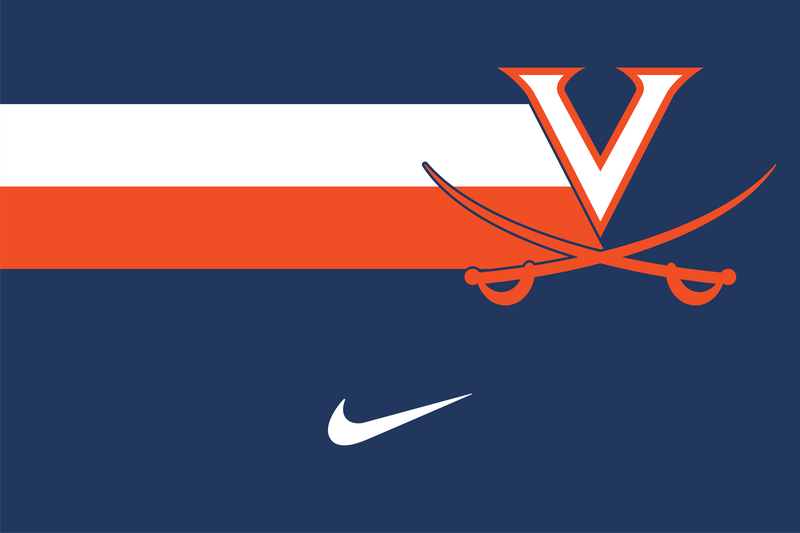 Virginia has a rather sedate look to their identity. Their football helmets went on a bit of a bender for a little bit but they've since recovered and now they'll see new uniforms take the field this season. Baseball has a classic look and even the hockey team does too. The odd men out to me were the basketball team, and I really don't understand their uniforms and maybe I just missed the explanation on them but they don't really fit the brand... until now. Football - I LOVE the navy throwback uniform the Cavs have worn over the last couple years and that really set the theme for most of the uniforms. Then they leaked new uniforms and my thought processes about their looked changed a little bit. I did some research and found some orange throwbacks from a couple years back and used those stripes as well and then I had found the theme I wanted to roll with. Helmets are white and navy with the triple stripe. V-sword logo graces both sides. No chrome, no fades. Jerseys have the double stripe on the sleeves. I used the font from the navy uniform they've been wearing. Sidebar, I've never really been a fan of the Times New Roman/Fitz Quadrata looking number font so I got rid of it. Pants have the triple stripe. 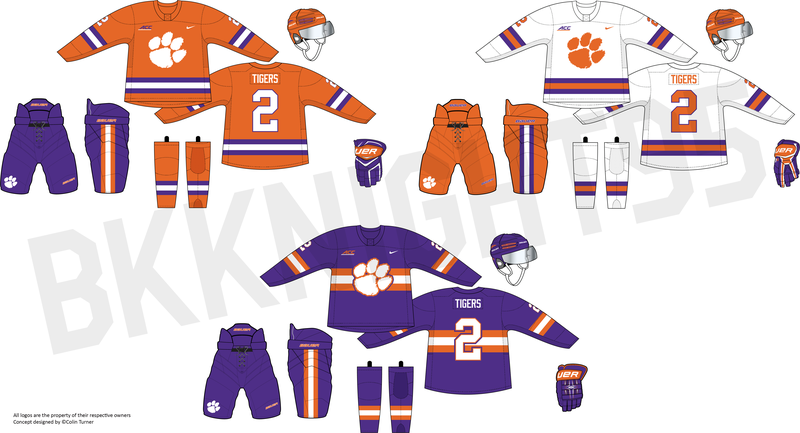 I didn't add an orange helmet or pants because in the ACC there's already a lot of orange between a certain two teams and I plus I don't think they look good in all orange plain and simple. Hockey - These are my personal favorite out of this set. They just are classic looking and clean. Easily enough, all the jerseys have the double stripe in corresponding colors, pants have the triple stripe, and socks have the double. Nice and easy. Baseball - Again, a nice and easy set of uniforms. Double stripe on all the sleeves, triple on the pants, double on the socks. 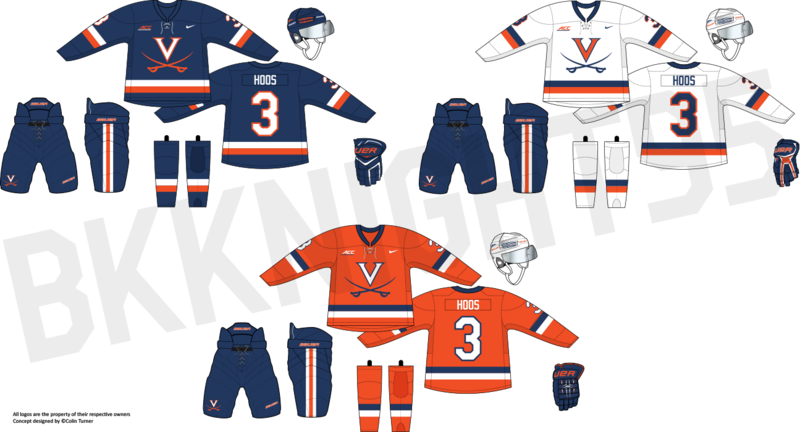 On the home and away uniforms, the VIRGINIA wordmark is on the chest and on the alternate the V swords are on the left chest. 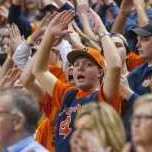 Basketball - These are where the most change occurs. As I said before, I just don't get UVa's basketball uniforms. 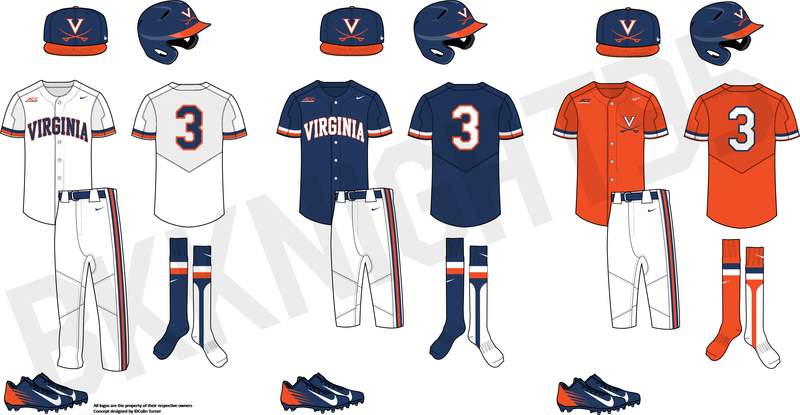 They don't have a lot of cohesion with any other uniforms worn by any other UVa sports team. Of course I could be wronger than wrong about that so if I am, please correct me. Anyways, these also follow the trends I've started. I did the double stripes on the cuffs of the jerseys and the waistbands on the shorts. I did the triple stripe on the collar and down the shorts. 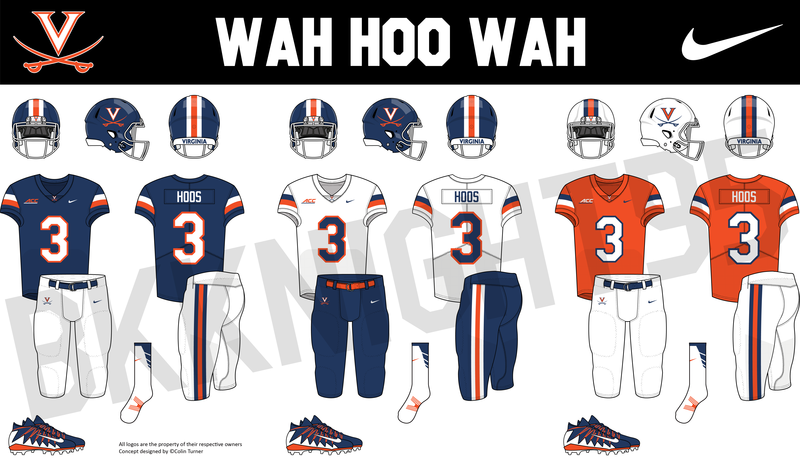 VIRGINIA wordmark is on all 3 uniforms. C&C welcome! I hope to not be away as long moving forward. Also, could you guys pick your favorite uniforms from each team? I want to feature a uniform from all four teams on my social medias and I will do this every set of four teams. And also, stay tuned for a football uniform picker. I was hoping to have it ready when this thread was ready to drop but I didn't have it done yet and back burnered it for the time being. Im seriously torn. I love Virginia’s current basketball uniforms, especially the font. It’s so bland but I haven’t seen it anywhere else, but you make these sets look just as phenomenal. Although Clemson has to take the cake so far. 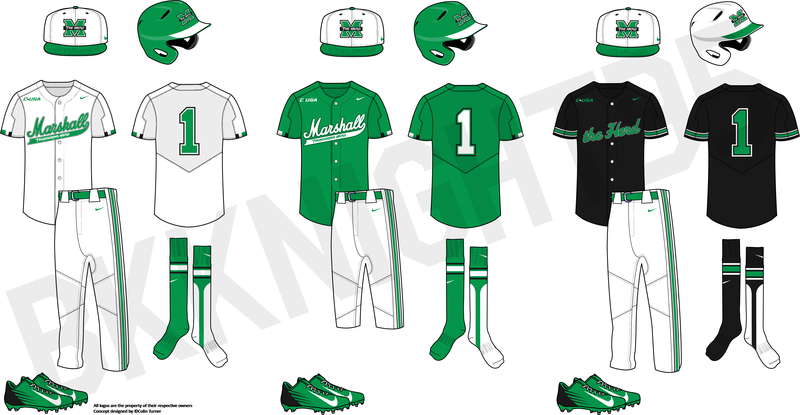 Basketball alts for Ohio and Clemson, Marshall's home hockey uniform, and Virginia's entire baseball set. Alright I don't have the next team ready, but the website is! Go check it out, of course I only have the four teams up now, but as I get more done they'll show up on the website! Shoutout to @wyopokes2 for his uniform picker from back in the day as the inspiration for my uniform picker! If you expected chrome helmets and black uniforms for Alabama in any sport, you won't find it here. Their football team has a look that has been the same since the '60s and doesn't need anything flashy. Need I say more? Football - Not a whole lot to say. The look doesn't change much at all from what we're all used to. Only changes are the helmet font and the pant stripe changes to a single stripe to match the helmet. Hockey - A simple look, basically the Red Wings if their red got darker. The stripes do appear thicker on these jerseys than the rest. The super thin stripes just didn't look good on the hockey jerseys. Other than that, single stripe pattern is repeated pretty much everywhere, including the helmet. Baseball - Baseball continues the theme of super simplicity and thin stripedness. I couldn't decide on which helmet I liked more between the striped one and the more traditional one so I kept them both. 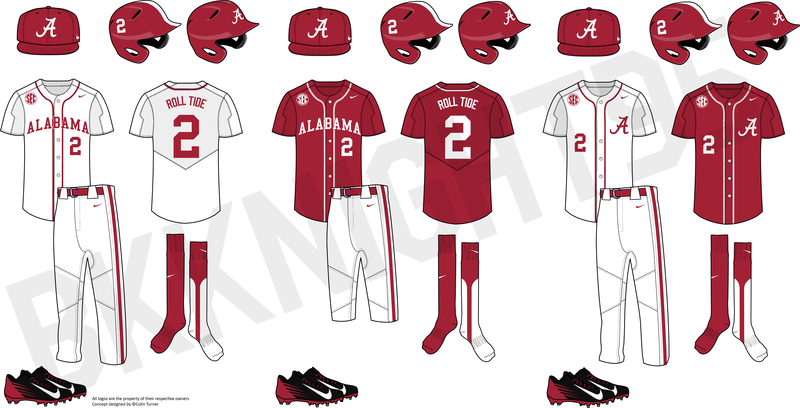 So Bama baseball ends up having the most uniform options out of all the teams. 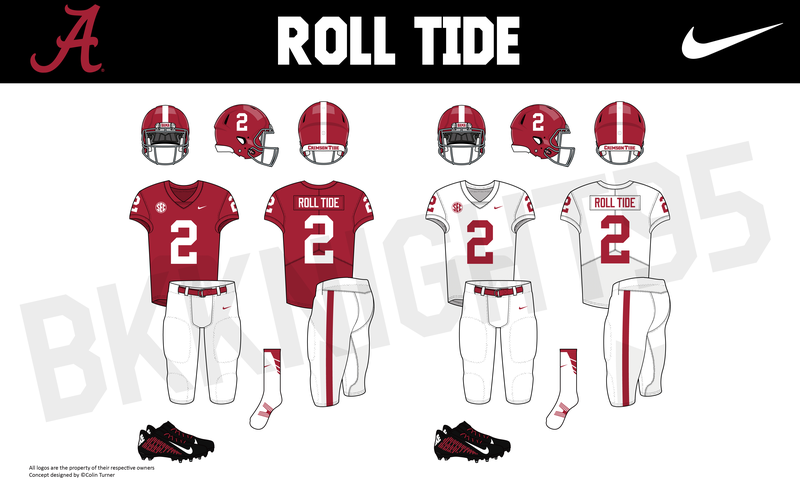 I gave them two alternates, although they aren't much different than the normal home and away unis. Basketball - The basketball team finishes off the set with a nice and easy set. Single stripe around the arm holes and a colored waistband and single stripe down the shorts. Overall a nice and easy set, but I warn you, the modern teams are coming. C&C welcome!